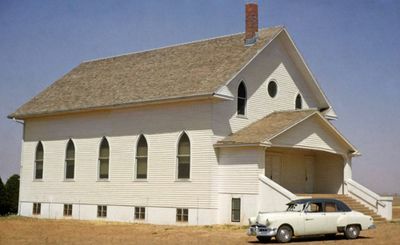 The Bible Mennonite Brethren Church (formerly Bessie Mennonite Brethren Church), Cordell, Oklahoma, was organized 6 January 1905 with 35 members. At first the meetings were conducted in a country school. A church 36 x 26 ft. was built in 1906, and in 1929 a 56 x 36 ft. church was constructed. Andrew B. P. Schmidt served as the first leader of this group. In 1908 Jacob Reimer was ordained to the ministry and in 1919 as elder. He served the church well as pastor for many years. To 1949 a total of 207 persons have been added to the same by baptism. The 1951 membership was 157 and the pastor, Elmo Warkentin. The following missionaries had come from this church by 1951: Pauline Foote, Peter D. and Anna (Schmidt) Kiehn, Peter D. and Mary (1st wife) Susie (2nd wife) Kiehn, all of whom have labored in China; and Mr. and Mrs. Ruben Wedel, who worked among the Mexicans of South Texas. Siemens, John K. "Bible Mennonite Brethren Church (Cordell, Oklahoma, USA)." Global Anabaptist Mennonite Encyclopedia Online. 1953. Web. 23 Apr 2019. http://gameo.org/index.php?title=Bible_Mennonite_Brethren_Church_(Cordell,_Oklahoma,_USA)&oldid=146944. Siemens, John K. (1953). Bible Mennonite Brethren Church (Cordell, Oklahoma, USA). Global Anabaptist Mennonite Encyclopedia Online. Retrieved 23 April 2019, from http://gameo.org/index.php?title=Bible_Mennonite_Brethren_Church_(Cordell,_Oklahoma,_USA)&oldid=146944. Adapted by permission of Herald Press, Harrisonburg, Virginia, from Mennonite Encyclopedia, Vol. 1, pp. 300-301. All rights reserved. This page was last modified on 18 January 2017, at 21:55.